Rapid Fire – Game 3 – Third Game in the Gun Bar – He Rolled Ones! Feng Shui literally means “wind-water” in English. This is a cultural shorthand taken from the passage “Qi rides the wind and scatters, but is retained when encountering water.” Historically, feng shui was widely used to orient buildings—often spiritually significant structures such as tombs, but also dwellings and other structures—in an auspicious manner. Depending on the particular style of feng shui being used, an auspicious site could be determined by reference to local features such as bodies of water, stars, or a compass. In the wargaming sense, feng shui refers to the side of the table that always rolls 1 when 6 is needed and 6 when 1 is needed. Today, for a change, Anthony had that side of the table whilst I had his previous side. 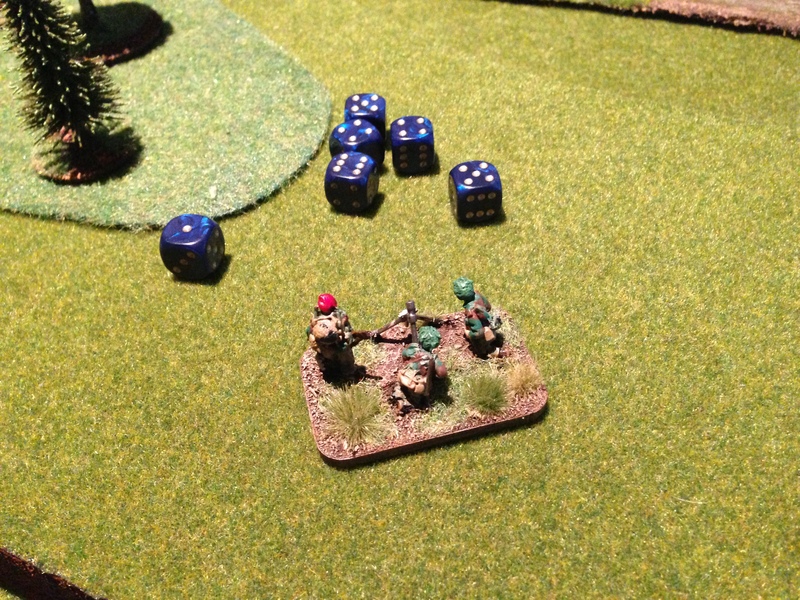 He rolled sixes to move through woods and rolled ones for damage when he managed to get some shots off at the Shermans. The battle was another village defense/offense with your typical river and bridge. The difference this week was that the British Paras had control of pretty much all of the village and only had to hold out until reinforcements arrived and put the attacking Germans to flight. There was one company of Paras and a brigade headquarters on table at the start with another two companies coming along 1D6 bounds later (five as it turned out when I rolled five and at that point I was thinking “oh crap, here we go again’ as I rolled six for reinforcement delay last week). Attacking was a battalion of Panzer Grenadiers with supporting elements including a Panther tank. My reinforcements included two Shermans. 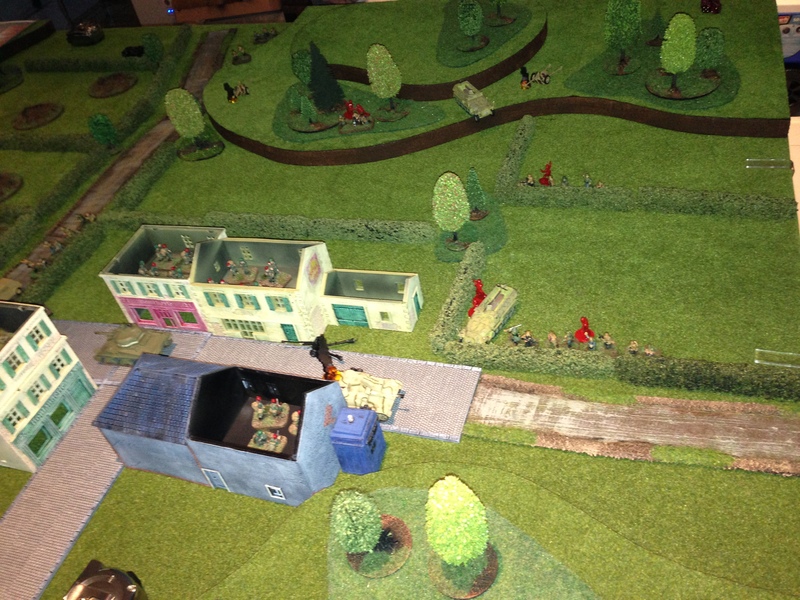 The paras managed to hold the buildings and managed to take out both German anti-tank guns that we deployed on a nearby hill covering the likely approaches of the British reinforcements. A short while later the British supporting elements took out one of the Hanomags ((incorrectly as it turned out later as the Hanomag was taken out with reserved fire from a mortar but hey, we are learning the rules and we just about got reserved fire down pat today)). 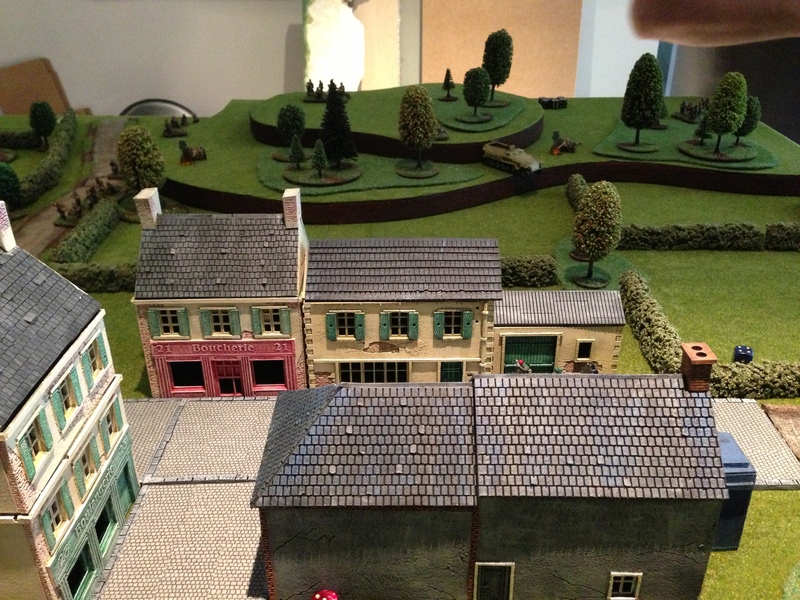 The German advance was slowed by this and some uncomfortable terrain. Meanwhile the Panther was throwing high explosive rounds (HE) into the village until a partly hidden 6-pdr anti-tank opened up on the tank. For its opening shot I decided to use one of the APDS ((Armour Piercing Discarding Sabot)) rounds. I needed to roll a 5 or a 6 to hit. I rolled 4. In the next bound I decided to just keep firing AP ((Armour Piercing)) rounds, needed a six to hit the I rolled 5. That’s how the dice roll some days. 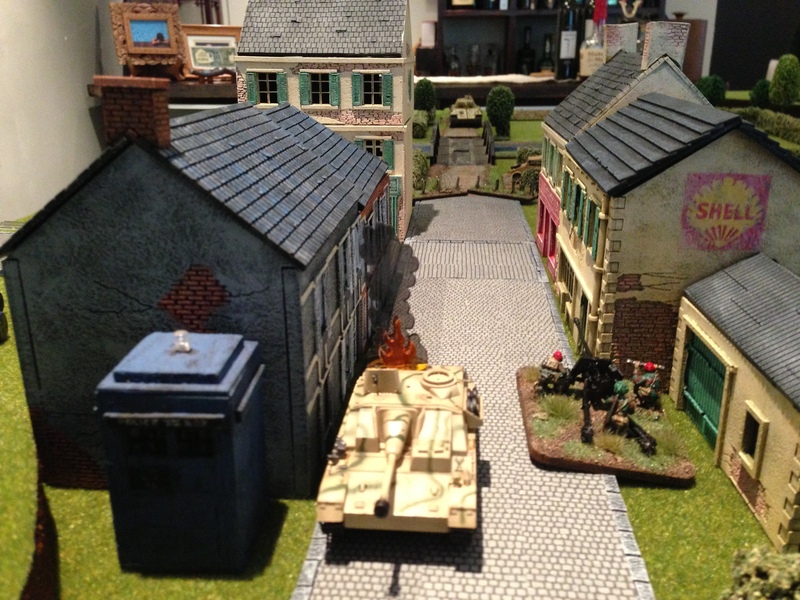 In any case the sound of AP rounds pinging off the Panther’s armour was enough to distract them from pumping more HE rounds into the village. 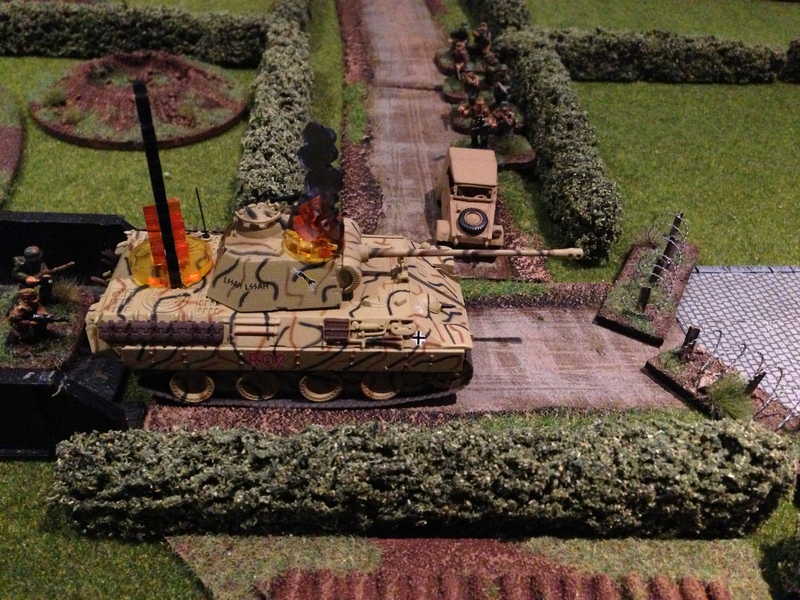 The anti-tank gun survived well until the Panther moved up close and deadly. 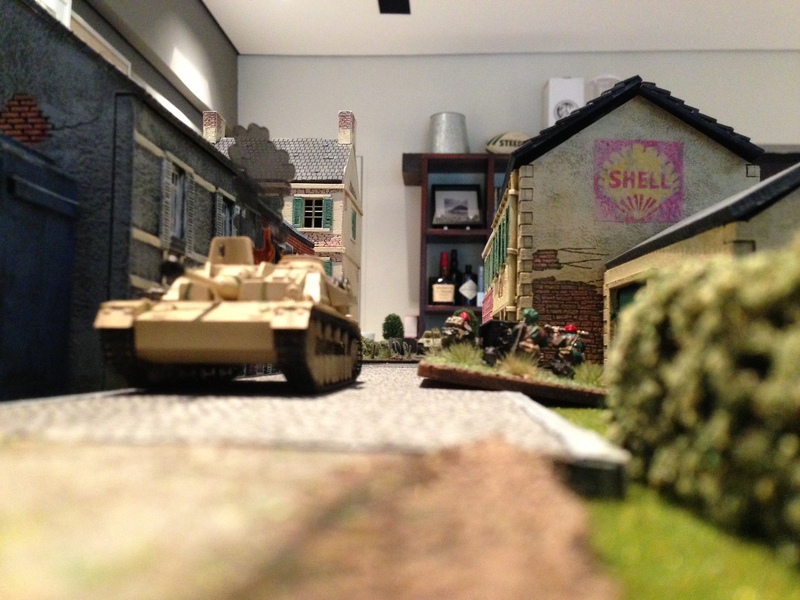 My reinforcements arrived and the two Shermans along with an infantryman hidden but armed with PIAT ((Projector, Infantry, Anti Tank (PIAT) was a British man-portable anti-tank weapon developed during the Second World War)) set about eliminating the Panther. They did. One crazy German armed with a Panzerfaust ((literally “armour fist” or “tank fist”, was a cheap, single shot, recoilless German anti-tank weapon of World War II)) did charge successfully in at one of the Shermans but the moment got the better of him and as he fired his weapon the sound of the dice rolling, then stopping to reveal a one was sweet music to my ears. A company of Paras opened up in the poor chap and it was good night to him. At this point a sad veil similar to previous veils was drawn over the scene but with a difference. This time the veil was being drawn over the German force. We learned quite a bit from today. We think we have worked out the reserved for and the fire and movement rules. We will both reread the rules during the coming week to see what else we can learn. We did also learn that villages and buildings are tough nuts to crack and at this stage of our ability, if there is a built up area, the attacker should probably have odds of 2.5 or even 3:1 to have a chance. Balance or balanced objectives (delay enemy from village – that type of thing) will doubtless become more important as will the feng shui of he gets the bad dice rolling side of the table. Oh, and the most important thing? Today’s lunch was an English Breakfast and the lady of the house kindly made the British commander (that was me) a nice cup of tea at a crucial point in the battle. The tea provided the turning point. So this is when my curse started.